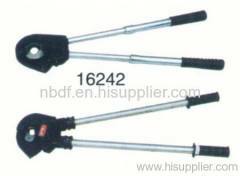 Hydraulic Conductor cutter is used for cutting ACSR conductor or earth wire. The blade of cutter is made of alloy steel. Ratchet Conductor cutter is used for cutting ACSR conductor or earth wire. The blade of cutter is made of alloy steel. Group of Conductor Cutters has been presented above, want more	Conductor Cutters and ACSR conductor cutter, Please Contact Us.